Wow, where did this year go? I can't believe my precious boy has been with us for a WHOLE YEAR! What joy and blessing this little guy has brought into our family. Have a daughter is such a treasure, and likewise, having a son is so unique. The bond is so different and special in a whole new way. This little boy has changed me, I mean look at that face! Don't you just want to cuddle him??? And trust me...he wants to cuddle with you. Addie is my little independent, strong-willed fireball, and Jett is my soft, cuddly mama's boy! At least for now...(mama is hoping he stays that way!) As far as I can see, they are as different as they come, except for their volume, I have got some LOUD children. But, I have to say, they come by that honestly! He got a whole bunch of trucks for his birthday, but I think this one from Mimi and Poppy takes the cake. Daddy seems to like it a lot too! 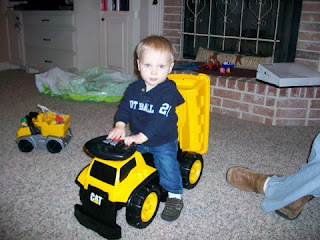 You can load all kinds of stuff into the dump truck part, or you can ride it! He also got a bunch of balls. Boy and girl presents are so different! Addie wanted Jett to have a red cake with white icing. 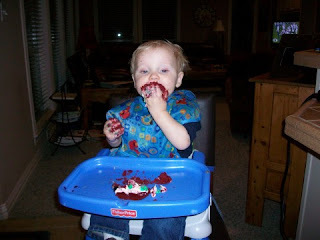 So, while he napped on Saturday, Addie made his cake for the little family get-together that we had Sunday night. She did it all, even held the mixer! She said that it had to have "racing cars" on it, so here is the finished product. I will post some stats after I take him to the doctor on Thursday. Right now he has 1 and a half teeth! He is such a funny child. He laughs about everything, loves to dance and spin, chase after his sister, still loves to be held, and LOVES to eat! He's not saying much yet...attempts "snack, lunch, nurse...(yes, those all have to do with eating)Jett, mama, dada, ball, and book." But, I am pretty sure anyone that lives outside of this house would not know what he is saying. He mainly sticks to grunting and yelling, in true "caveman" style! He brings so much joy and entertainment into this house! Jett, your mommy and daddy love you so much! You are perfect just the way that God made you, we wouldn't change one single thing! What a precious gift God has given us in you! He is a cutie!!! 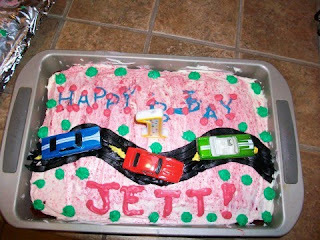 Happy birthday Jett! I can't believe it has already been a year!!!! Happy Birthday Handsome!